We’re getting out our warm, cozy Midwestern comfort food recipes for fall… and we’ve got LOTS, so expect more of them as the cold hits! This is a recipe straight from Darlene Nueske, Bob’s wife, and her two sisters. We had this dish in our recipe book long before the recent Cauliflower Renaissance of the past few winter seasons. Whether it’s due to the carbohydrate reduction craze or just because of a growing general interest in incorporating more vegetables into our diets, people are warming up to cauliflower as nutritious carb substitute. This recipe sure proves that it’s a meal-worthy vegetable! Savory Cauliflower Au Gratin with diced Nueske’s Applewood Smoked Ham. In a large bowl, combine the flour, cream, salt, pepper, and cayenne pepper, whisking to mix. Stir in the cauliflower florets. Set aside. In a large skillet, melt the butter over medium to medium-low heat, adding the ham and garlic when butter is beginning to brown. Sauté the smoked ham and minced garlic until the garlic begins to soften and brown slightly. As soon as the garlic begins to brown, add the cauliflower mixture to the skillet. Bring the mixture in the skillet to a low simmer, stirring frequently, until the mixture thickens and the cauliflower softens. Transfer the contents of the skillet to a greased 2-quart baking dish. 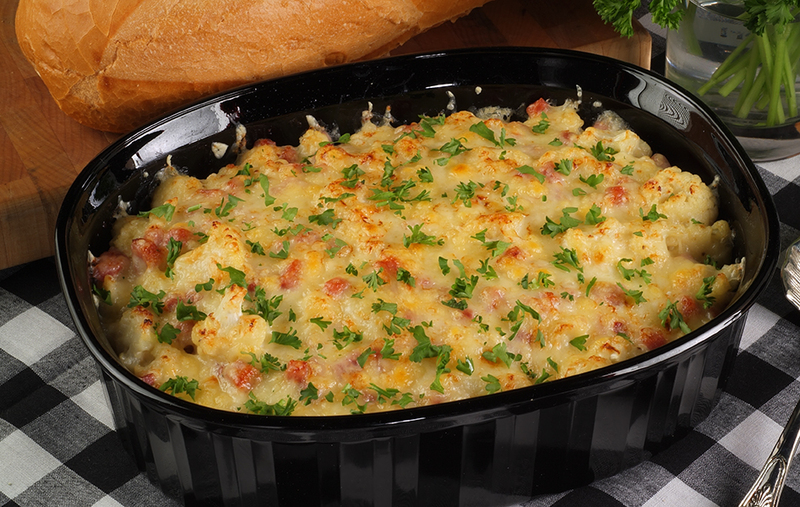 Top with shredded Swiss cheese and parsley and place the baking dish into the oven, setting it to low broil, until the top is lightly browned. Remove from oven and serve while warm. Enjoy… from the Nueske family to yours!